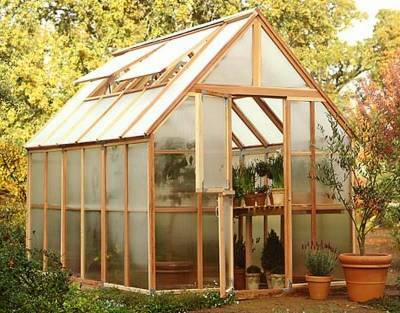 The greenhouse combines top quality components and functional design. Assembles Easily and Quickly . 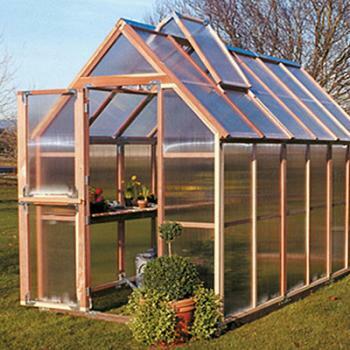 The major components of the Greenhouse Kit are panelized for an easy sure fit. And each Kit comes with easy-to-follow instructions, and a convenient product assembly video. The Greenhouse was tested by an independent lab, and withstood their maximum wind load capacity of 85 mph with no damage. Automatic solar-powered vent operators on the roof and the base of the Greenhouse contain a paraffin (wax) cylinder that expands when the temperature reaches about 65 degrees F., pushing the vent open to its fully opened position at about 85 degrees F. As the temperature cools and the paraffin contracts, the vent operators springs draw each vent closed. It is also easily detachable for manual operation. A circulating chimney effect is created as cool air is drawn in from the base vent, and warmer air is allowed to escape from the hottest point at the roof ridge. 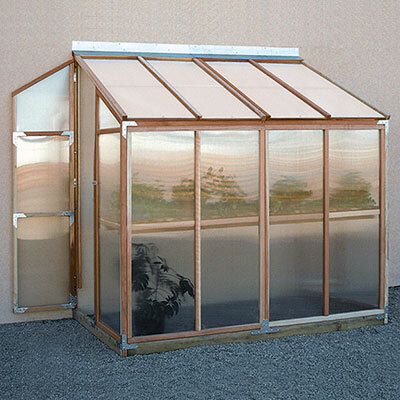 The frame base of the Greenhouse is a durable plastic with the authentic look, color and texture of redwood, but with the consistent properties of plastic, making it resistant to insect and moisture damage. Tell me about the Redwood Frame. We use redwood for its dimensional stability. Wood acts like a sponge; when it absorbs moisture it swells and when it loses moisture it shrinks. Redwood has thinner cell walls which shrink and swell less than other woods, so redwood is less likely to warp, split, cup or check. There are many reasons including it's natural beauty and durability. Redwood heartwood is naturally resistant to decay and insects. Redwood is an excellent choice because it is easy to paint, stain and glue, and no other softwood holds paints, stains and other coatings better than redwood. Redwood is not an endangered species. There are more redwoods today than when man first harvested the trees.